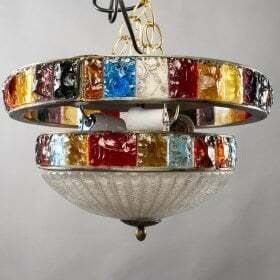 We carry an impressive inventory of light fixtures including antique chandeliers, antique sconces and antique lamps. The majority of antique lighting we offer is European and you'll always find a wide variety of sizes, styles and materials. Some of the periods and styles we specialize in include: Art Deco, Murano and Venetian glass, Gothic, Modern / Midcentury, Art Nouveau, Traditional, Victorian, Fer Forge, Italian and French. When choosing lighting for her clients, Judy looks for quality, pleasing proportions, and the distinctive details and style that best represent a particular decorative period or movement. Judy's expertise and eye for craftsmanship allow her to find pieces on par with Baccarat, William Brandt and Schneider, but without the hefty price tags. By focusing on quality and design rather than prestigious brand names, we're able to offer our clients the finest European antique lighting at exceptional prices.